Registration grants full access to all FreePBX World conference sessions. Also includes access to all ITEXPO keynotes, general sessions, free workshops, networking receptions and unlimited exhibit hall access. 10:00-10:30am: What are the plans for FreePBX in the next 12 months– Bryan Walters of FreePBX/Schmooze – The technological expectations of todays business communication systems have gone through all sorts of changes over the past decade, Review our plans for FreePBX for the next year as well as features and ideas that are being worked on to keep up with the rapid advancements in technology. 11:00-11:45am: Preview of Asterisk 12– Billy Chia of Digium– Overview of what’s changing in Asterisk 12 and how these changes will impact future features and possibilities of FreePBX. 3:00-3:30pm: Allison Smith Observations of a Telephone Voice– Allison Smith the Voice of Asterisk –Allison Smith – the Voice of Asterisk, as well as the voice of countless other platforms for major telcos and large and SMBs alike, discusses her observations of IVR systems from her unique vantage point – from behind the mic, as one of the world’s most prevalent telephone voices. Are telephone systems becoming more intuitive; easier to use; and less frustrating for callers to navigate? They’re a necessary evil in today’s turnkey world, but are we still making it as difficult as possible for callers to get what they want? 4:00-4:45pm: CyberData Product Overview and integration into FreePBX– presented by CyberData –Product overview of the CyberData product line from paging gateways, door access control, key-less entry and intercom boxes all fitting into the FreePBX EcoSystem. 9:00-9:45am: How to present, sell and close FreePBX systems to your customers– Preston McNair of FreePBX/Schmooze – Talk about the best practices for presenting and selling FreePBX systems to your prospective clients. Open Standards give you a lot of flexibility when designing client solutions, we will cover how to present the FreePBX EcoSystem and what FreePBX brings to the table to help you win more business, as well as some pitfalls to avoid when presenting Open Source products. 11:00am-12:00pm: FreePBX Developer Roundtable/Getting Involved Community Q&A with the Core Development Team – Community Q&A with the FreePBX Team. 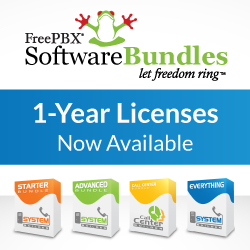 Ask any questions about FreePBX and the EcoSystem. 1:00-1:30pm: Project Documentation – How to write and contribute back to the Project– Andrew Nagy of FreePBX/Schmooze – The FreePBX community is a fantastic community for developing, contributing and getting support. The vast majority of all manuals and guides have been created and maintained by people putting in voluntary contributions of their time, to give back to the project. This creates a very stable community and home for documentation and allows us to focus on development and improving FreePBX. In this session we will cover how to write documentation and contribute it back to the Project. 1:30-2:00pm: Security as it relates to FreePBX and Asterisk– Scott Holtzman of Micro Advantage -We will discuss best practices with securing your FreePBX server from internal and external attacks and tools to use to make sure you have the most secure server but still access for remote workers and SIP Trunking. 2:00-2:45pm: IPAD Replacement to your Desktop Phone– presented by Mocet – Mobile devices like the Apple iPad are rapidly being adopted in business as the go to device for collaboration. But there are serious challenges in deployment, provisioning and support. Learn how you can address those issues while delivering HD wide-band voice quality and dramatically simplifying the end user experience using the MOCET Communicator and FreePBX Endpoint Manager. 3:45-4:30pm: FreePBX Certified Reseller Program – requirements, features and benefits– Preston McNair of FreePBX/Schmooze – Being a FreePBX certified reseller provides access to Education, support, Leads, Hardware, Software and Support Discounts as well as special buying groups and partnerships. We will outline the Requirements, Features and Benefits of the Certified Reseller Program and the Training Classes designed to help resellers close more sales and compete directly with legacy phone system providers.